.Modern, fast and luxurious, Riviera offers accommodation for up to 9 guests in four wonderful cabins located on the lower deck. Both the master and the VIP suite are full-beam, this means they’re very spacious, light and airy. One of the two twin cabins offers an additional Pullman bed; all cabins have en-suite facilities and flat screen TV. On the main deck, a beautiful salon offers ample space to relax on two sofas and a separate formal dining area. On the foredeck a spacious and perfectly equipped galley allows our chef on board to cook delicious meals and the bridge deck also include a sofa with a coffee table to enjoy the navigation. 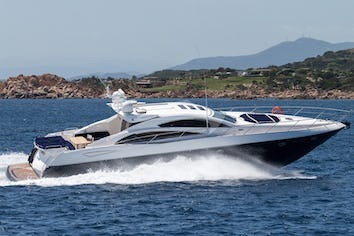 Riviera also boasts expansive deck space: on the aft deck there is a beautiful alfresco dining area while on the foredeck a beautiful solarium is ideal for sunbathing. 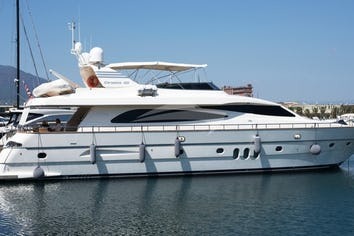 But the very cherry on top of this wonderful vessel is the fly bridge that hosts a second helm station, a large sun-pad and a wetbar with a dinette and a barbeque grill. The wonderful MY Riviera, with her polished interiors, her ample deck spaces and her top speed of 36 knots, will safely and comfortably transport her guests for incredible journeys at the discovery of the breathtaking Mediterranean coasts. RIVIERA can accommodate 9 guests in 4 cabins. The Master cabin has a king size bed, shower and toilet. A Guest cabin has a king size bed, shower and toilet. A Guest cabin has 2 twin beds, a pullman, shower and toilet. A Guest cabin has 2 twin beds, shower and toilet. RIVIERA is fully air conditioned through out. Crew has a separate heads and shower. We are having the best trip ever!!! the crew is spectacular!!!! they are treating us like gold and the boat is stunning. We really don't want to leave. I will recommend this boat to any client that is looking for this kind of trip. I have to thank you so very much. My friends and I are in awe. I forgot to mention the food!!! It is out of this world. We want Salvatore #2 to write a cookbook. We have never eaten so well. The crew was sensational Experience of the boat was beyond expectations and overall fabulous experience. We definitely will be rebooking the Riviera. We went on a cruise to Sicily at the end of September 2012. It was really very nice. We embarked in Palermo and then we visited the Aeolian islands. We have never seen a place like this! Beautiful, especially the fantastic colors of the sea: turquoise, green, blue. The fishermen brought us fresh fish on board every day, and the very friendly and capable chef cooked them for us in all kinds of different ways. The breakfast was very nice especially the fresh Sicilian orange juice. The boat was very comfortable, spacious and well designed. We had 2 days of bad weather and the skipper, who was very good and kind, brought us in the tender to some small bays with crystal clear water and white sandy beaches. We have some great swims and incredible snorkeling. Congratulations to all the staff who with their kindness and professionalism ‘gave us an unforgettable week. We spent a week cruising on the Riviera yacht last August, with 4 days in the Bay of Naples, visiting Capri, Positano and Ischia, and 3 days sailing round the islands of Ventotene and Ponza. We enjoyed ourselves greatly, the sea is fantastic, the islands beautiful and the people very welcoming. The Riviera yacht is very comfortable, especially the cabins. The staff is very helpful and professional. The chef caught octopus and made an exquisite dish of spaghetti. The skipper prepared delicious aperitifs at sundown. It really was an unforgettable experience. We spent a week as a family on the Riviera yacht from 22 July. It was an unforgettable experience. Capri, Ischia, Positano, the Amalfi Coast – all magical places. The yacht is very comfortable, its staff extremely kind and helpful. The chef prepares exceptional evening meals with the freshest of fish, the skipper is professional and very likeable. We will definitely be doing it again next year. We had a great cruise on RIVIERA this July out of Naples. loved the yacht and the crew – had an incredible time; “the captain and his crew are delightful people to work with”; the cruise went exactly as imagined and more! Thank you so much! We will be back! Everyone loved. The charter, the boat, crew and itinerary were perfect. Food was also great. Our vacation was really a dream and we will do it again as soon as possible. 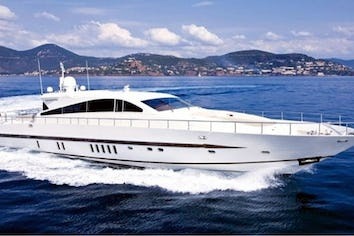 We had the happiest week on “MY RIVIERA”- the boat is simply beautiful in its layout space and interior decoration. But above all: your fabulous crew- for safety, sail and supple. Salvatore always paying attention, Rita always helpful and smiling and Salvatore! His meals were the best, we will miss all of them. We wish you a wonderful trip to the South – we hope to come back – same boat, same crew.